Dean talking buttocks as Newcastle match day arrives and Chelsea details emerge. Saturday morning, 7am. It’s cold out side, very cold, but thankfully the snow has failed to materialise in Brentford. With the FA Cup behind us for now (although the club did confirm details about the Chelsea game on Friday – more below) it is back to League action for the Bees as Newcastle United are the visitors to Griffin Park. In the red corner, Scott Hogan. He’s the man, the man with the midas touch. Worth his weight in gold, and goals, he’s been finding the net for fun this season yet now finds himself the absolute centre of transfer speculation as those West Ham stories just won’t go away. In the blue corner (with orange trim), Dwight Gayle. Outright occupant of the penthouse suite in the Championship leading scorer hotel. Scott’s 14 are still 5 behind the Newcastle United man who showed first hand back in October how deadly he can be. Gayle’s brace contributing to a 3-1 win over the Bees at St. James Park and he hasn’t looked back. So the big question, will we see them face off today? From one respect the good news was Dean Smith’s confirmation in Thursday’s press conference that “Scott Hogan’s buttock is fine, he has trained all week and is available for selection,” The pair were due to speak yesterday to assess the situation and then, come 2pm (or closely after) we’ll get our first look at the team sheet to see if Lasse Vibe retains his place up top or Scott walks straight back into the side. I can only expect the later. With no fee having been agreed or deal signed then one can only presume he’ll be leading the line. Unless Scott is having some form of hissy fit à la Diego Costa or Dimitri Payet (how angry must Chelsea and West Ham fans be today?) then surely the chance to prove his mettle against the second best team in the division will be the perfect shop window for a player harbouring dreams of top flight football at some point in his career. Whether that be next week or next season. No Brentford fan wants to see Scott leave but is anyone naïve enough to think we could turn down figures in the region of £15million? More to the point, given what he has been through in his career to date, would anybody really stand in the player’s way? Scott will go to the Premier League at some point soon – whether January or the summer. Of that, have have absolutely no doubt. He’s just too good. 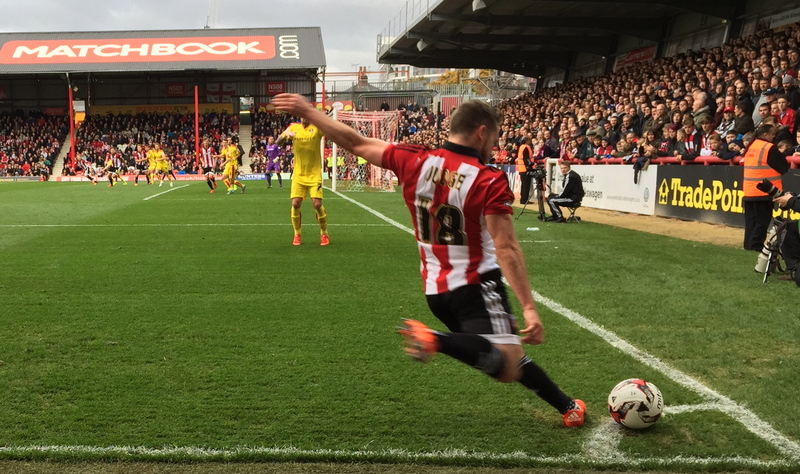 Today could well be our last chance to see him at Griffin Park. At least, in the red and white of Brentford. We’ve only one more home game until the transfer window closes and that’s an evening kick off, on January 31st, against Aston Villa. I’d love to see him starting that one but in my heart of hearts I fear we’ll have said farewell by that point. Come on Scott. Could today be the last time we’ll see scenes like this? Instead, let’s just live for the moment. Can Harlee Dean and crew keep out Dwight Gayle at one end, leaving Scott free to try and catch Newcastle’s free scoring goal machine at the other? Here’s hoping. This afternoon’s game has goals in it, no doubt. The only question being just how many? The one piece of news that the club have been able to confirm is that surrounding the FA Cup fourth round tie at Chelsea. It was announced yesterday that that game will be a 3pm kick off on Saturday 28th January. A not surprising decision but, at the same time, given the home team’s subsequent league fixtures there was always the thought it might be brought forward to Friday night or even Saturday lunchtime. As with our previous visit to Stamford Bridge, we’ve been allocated all 6,000 tickets in their ‘Shed’ end. Details of sale are yet to be released although with the game only a fortnight away expect this to be imminent. The pricing structure of £30 adults and £15 kids is (relatively) competitive – I’m still baulking at the £41 charged by Leeds United – so filling that end to get Chelsea rocking won’t be an issue. With a home game against Brighton and the aforementioned Villa match immediately after that one, it has all the potential to be a wonderful few weeks for Brentford. This time ten years ago we were playing games against Leyton Orient, Yeovil Town and Carlisle United as the Bees eventually finished the season a the bottom of League One. Now we’re talking about selling players for £15million whilst taking on some of the biggest names in English football. For now, though, it’s all about Newcastle United. See you there. What a time of contrasting managerial emotions for Brentford and QPR. Hot off the heels of our derby day victory over the Loftus Road outfit (a three points that Derby County then enjoyed on Tuesday night) Rangers have parted company with Chris Ramsey. Lee Carsley, meanwhile, has just been announced in the shortlist for manager-of-the-month. I take no pleasure in anybody losing his or her job. Regardless of the team. Indeed, it doesn’t seem like five minutes ago we were embroiled in Village-gate and Mark Warburton was hot favourite to take over at QPR. Instead, with Tony Fernandes announcing that he was close to announcing his ‘dream manager’, Warbs eventually went to Rangers (the Glasgow incarnation) whilst Chris Ramsey took over at Loftus Road. How things changed. Rangers exited the Premier League; Brentford came to within a play off game of making it. And now, with the Bees on the charge once more, QPR continue their slide downwards. No doubt their fans and top brass will be worried they are looking like following the recent likes of Wolves directly into the Division One. With it, will come potential games against the likes of Mansfield Town, Carlisle and Accrington Stanley next season. Whilst I can’t see it happening it does show how fleeting football form can be. Lee Carsley, meanwhile, has received the expected ‘reward’ for an October that saw us pick up 12 points out of 15 and four successive wins. Will he scoop the final honour? Well, being honest, I expect it to go to Steve Bruce at Hull City – they were unbeaten and a point better off. Likewise, victory over us on Tuesday (albeit in November) saw them reach the top of the Championship table. Either way, it is a tremendous reversal of form following the days of Marinus and Roy. And nowhere more has this been typified than in Alan Judge, who is also up for the player-of-the-month award. His four assists, three goals and scintillating play make him a very genuine candidate for this award. Ironically, former Bee Andre Gray, who has been scoring goals for fun at Burnley, could be a very serious rival for this one. Whatever happens, I’d rather be in our situation than that of Rangers who, this morning, will be sorting through the monogrammed CR tracksuits and starting the search for their next dream manager. As for us, whilst I’d hope Lee wins the prize I can’t look past Steve Bruce. Although, should he do it, then get ready to bet against Hull City at the weekend. We all know how that jinx normally works. Is his the first name on the teamsheet? It’s fair to say Brentford, Rotherham and Wolves are very much the form teams of the moment in the League but there is one player who stands out. I’ve praised him on more than occasion this season, based purely on my own observations, but I heard a stunning statistic at the weekend in regards to his abilities. Brentford have not conceded a goal whilst James Tarkowski has been on the pitch. 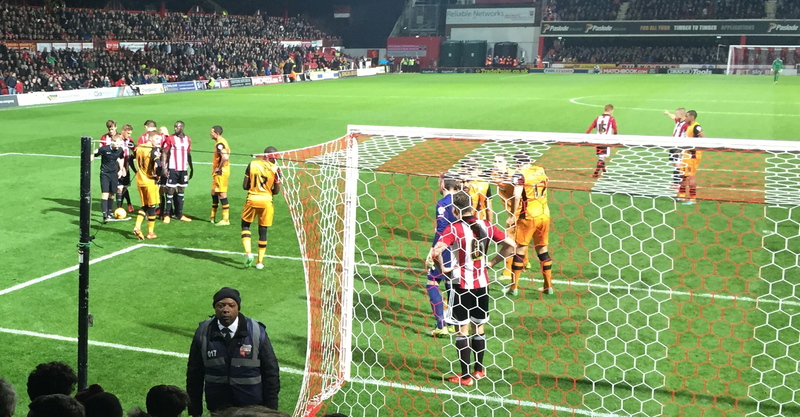 September 7th was probably the darkest day of the season, to date, for Brentford as Bradford City administered a 4-0 beating. That defeat, still our heaviest in League One all campaign, also saw a red card for David Button. Ironically, it was a result that came after the previous weekend’s 0-0 against Carlisle United although I’m not expecting any further déjà vu today. Too many things have changed since then. Is this the worst free kick of all time? Alan Pardew showing potential new owner Vince McMahon how much Newcastle United embrace the spirit of WWE. Deluded Arsenal fans (are you reading Richie Firth) still trying to convince themselves that ‘the treble is still on’. Brentford starting the next ‘unbeaten run’ with a draw at Carlisle United. Whilst the major talking points of the weekend are clearly all about the madness at Newcastle, Arsenal and QPR matching each other ‘choke for choke’ or the ongoing state of League One, today’s column has found something you may not have seen on Match of the Day. I’ve banged on about Gibraltar a lot this week, but last night they played their first match on ‘The Rock’ since officially becoming full members of UEFA. The game, a 4-1 reverse to The Faroe Islands, saw the home side take the lead at their Victoria Stadium before, eventually, capitulating. For me, it wasn’t so much about the result but the occasion. That, and the worst free kick you will, I am prepared to bet, ever see. 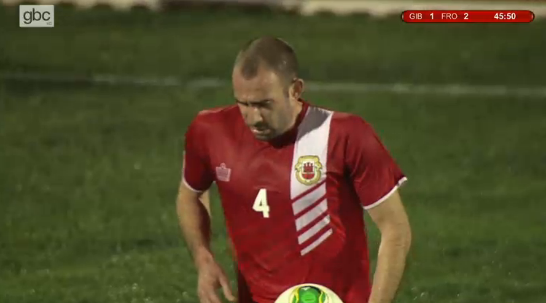 Former Manchester United and Stoke City star Danny Higginbotham, who has suddenly remembered he is Gibraltarian, was the man charged with executing a routine set piece just before the close of the first half. I won’t ruin what happened next; suffice to say that even Jonny Wilkinson would have been going some to match this. You can find it here, after 01.17.10. I’m sure Danny will blame ‘the wind’. Higginbotham takes aim at the runway..
That’s not to belittle the GFA – from small acorns mighty oaks grow. Besides, The Faroes also struggled in the conditions as you’ll see five minutes earlier on the same video. Whilst the penalty they missed wasn’t, quite, up to Higginbotham standards it wasn’t far off. 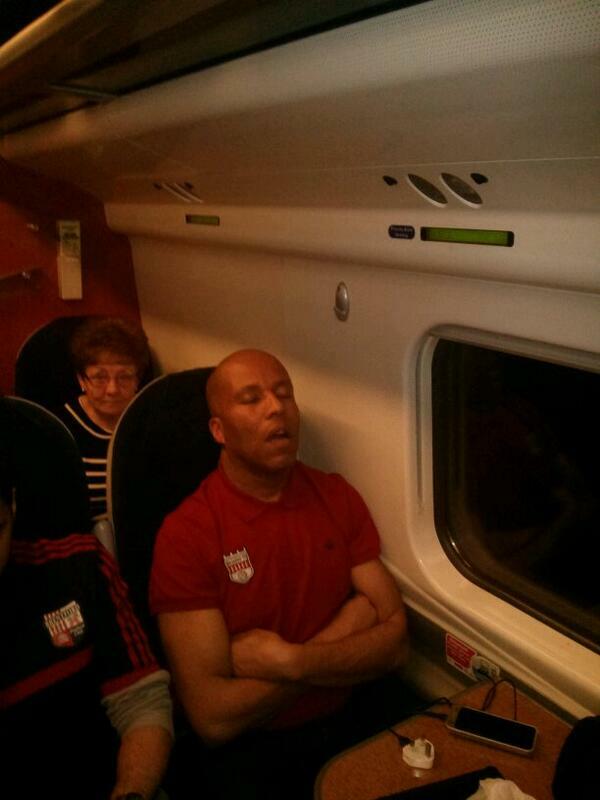 As for Brentford, well I suggest you stick to @Bessotted for the match update this weekend. I didn’t travel and haven’t even seen the ‘highlight’s on the Football League show. Hopefully, their service will be up to its usual standards, assuming Billy the Bee has now been able to compose himself sufficiently to write up his notes. Come on Billy – was it THAT bad a game? More strikers than London Transport – but who pays the penalty ? Awaiting today’s League One action between Brentford and Carlisle, I proceeded to torture myself by watching last night’s game between Hibernian and Dundee United. I say ‘watch’ – refusal to sign up for a second subscription channel meant it was actually a case of going ‘old school’ and following the game on the internet equivalent of the now, sadly departed, ceefax. The reason for this sudden interest in Scottish football was for, primarily, self-serving purposes rather than any particular desire to see who might limp into second place in the final table. Thanks Fulham! Trotta’s (independent) trade pays dividends for Brentford. ” Contrary to earlier suggestions, Marcello is not required to join up until Saturday evening. This can only be good news for The Bees. Since returning from Fulham for a second loan spell, Trotta really has found form. Previous criticism leveled about the Italian’s perceived ‘laziness’ has been well and truly dispelled. The player affectionately known to the Griffin Park faithful as ‘Rodney’ can now be seen putting himself about with more energy than the Duracell Bunny on a Red Bull binge. Well this is what twenty-one years (and a whole load more prior to that solitary season) of Brentford playing outside the top two divisions does to you. On the plus side, at least it brought about a quick and easy resolution to the club v country conundrum.